In Secret Sartre, the faculty members of an unnamed university department battle for ideological supremacy. A fragile alliance of upstanding rationalists, logical positivists, empiricists, liberal humanists, scientists and other fetishizers of the Enlightenment must work together to stem the rising tide of postmodernism. Watch out, though – there are closet postmodernists among you, and someone is Secret Sartre. 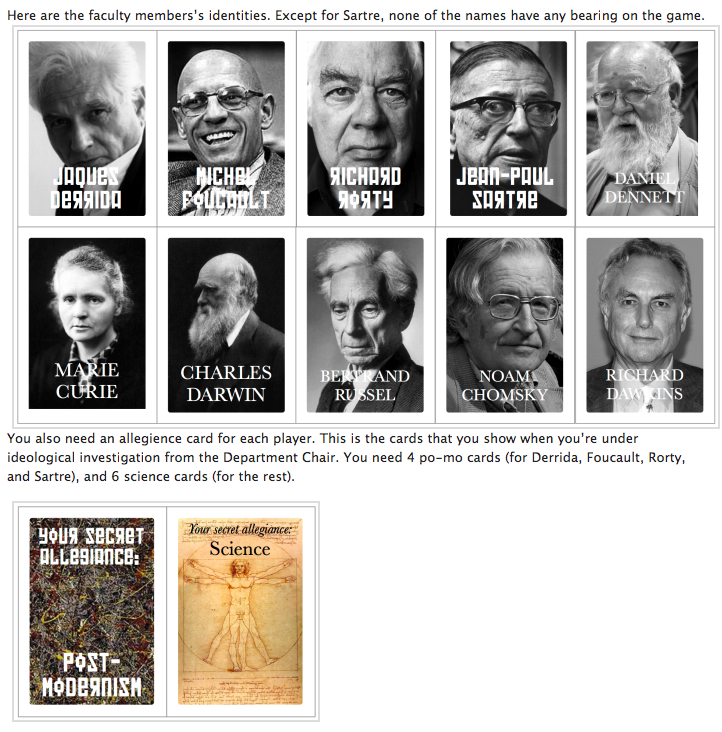 At the beginning of the game, each player is secretly assigned to one of three roles: Science, Postmodernism, or Sartre. Sartre plays for the postmodern team, and the postmodernists know who Sartre is, but most of the time Sartre does not know who his fellow postmodernists are. The Scientists are far out on the autism spectrum and don’t know who anyone is. The scientists win by enacting five rational policies or having Sartre fired. The postmodernists win by enacting six postmodernist policies, or if Sartre is elected Head of Studies late in the game. As postmodernist policies are enacted, the Department Chair gains new powers. Even scientists may find themselves tempted to enact postmodernist policies that help them control the table and assassinate their enemies. This isn’t a quick game to pick up; the rules need a bit of figuring out, and a familiarity with card games, and academic research philosophy, helps. You also need several players to get the full benefit of Secret Sartre. But even if you don’t play, the description of the rules is amusing, and it’s an interesting way of comparing and contrasting academic and research positions.